We hope this page will provide you with ideas and advice about all the different ways you can make changes, no matter how small or large, that could result in a big impact on the environment. Like fresh air, veg, and getting your hands dirty? 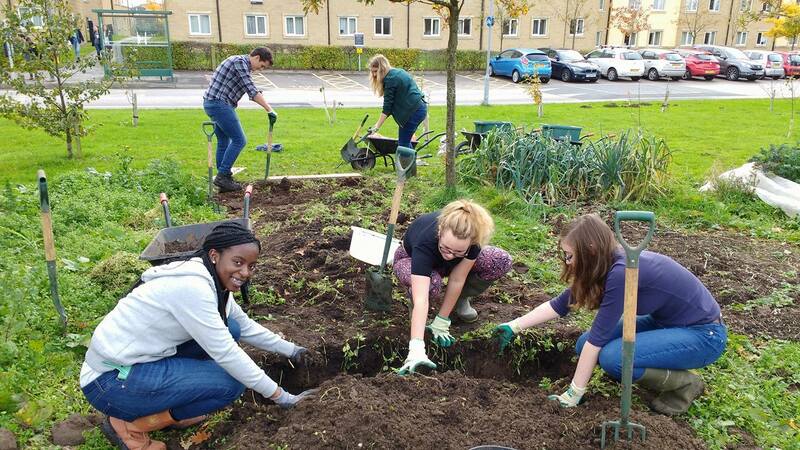 Stop by the EcoHub (at Alexandra Park) every Wednesday and Friday during term time between 1pm and 3pm for the Edible Campus Action Day! Tasks can include planting, harvesting, site maintenance, and various other activities. No signup is required; just come when you can and be ready to have fun, meet new people, and learn about gardening! 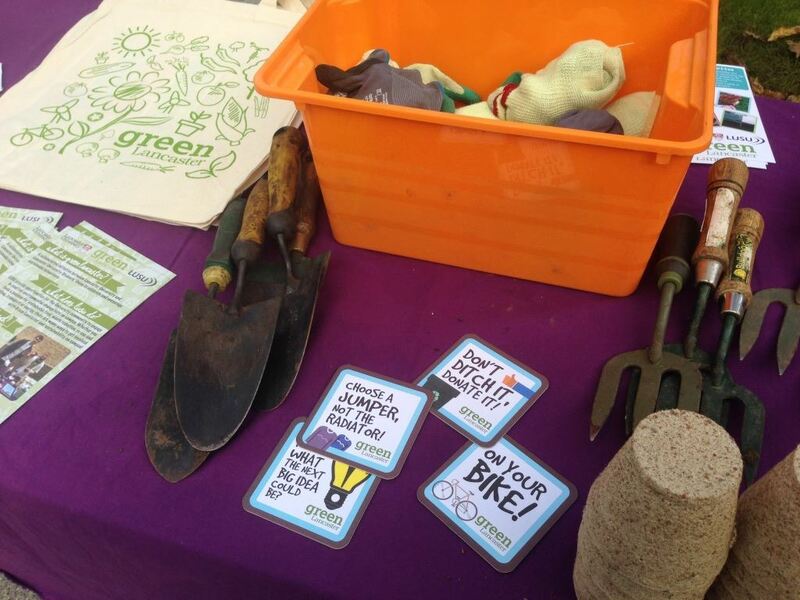 Find Green Lancaster at the Farmers Market in Alexandra Square every Thursday during term time for Edible Campus produce sales, KeepCup sales, Dr. Bike free safety checks and minor adjustments, and other events! If you would like to help out with the preparation or operation of the market stall, please join us at the EcoHub between 09:00 and 10:30 on Thursday morning of the market for harvesting (and free breakfast!) or between 11am and 2pm in Alexandra Square to help with stall operations. To book a volunteer place at the harvesting session or on the market stall itself, please e-mail us at green@lancaster.ac.uk by midday on Wednesday. Want to help look after our lovely flock (and keep any eggs you find)? Look out for induction events after Edible Campus Action Days or email green@lancaster.ac.uk to get involved. As part of Campus Life, the University Food Operations team hold several free cookery demonstrations and classes for the campus community during term-time. Follow @LUExecChef on Twitter for updates on available classes. Don’t Ditch It...Donate it! Our Exodus Re-Use project recruits student staff each spring to help divert waste from landfill and help local charities. The project itself runs from mid-summer term to the end of September, covering all the main college departures. Keep an eye out for collection points around campus to donate any unwanted clothing, household goods, and non-perishable food items. The university provides Dr. Bike services in Alexandra Square every Thursday during term time from 11am - 2pm at the Green Lancaster Farmers Market stall to offer free safety checks and minor repairs/adjustments. The university benefits from the most frequent ‘city to campus’ bus service in the country with up to and in excess of 15 buses per hour from the bus station to the Underpass. Walking to and from campus is a great way to make the most of the rural scenes between the city and University. It’s also a great opportunity to relax and take stock away from the hustle and bustle of the academic life. Keep an eye out for the university’s energy talks and seminars throughout the year. 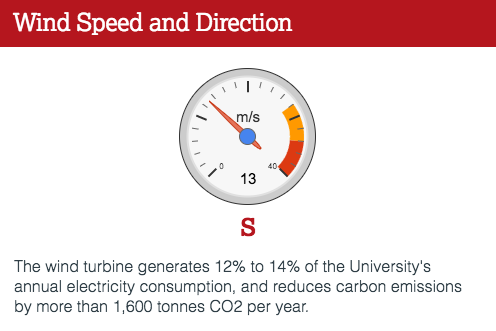 You can also stay up-to-date on the campus wind turbine and other energy efficiency initiatives via all of our communications channels. There is even a wind turbine applet on iLancaster! There are other opportunities where volunteers are needed to help out with things such as representing Green Lancaster at events. Sign up for our newsletter and follow us on social media to keep up to date with all of our activities and much more! The newsletter is distributed to your inbox every Monday at 4pm during term-time. We want to hear from you! If you have something you would like to share in the newsletter and on social media or would like to collaborate with us, email green@lancaster.ac.uk.